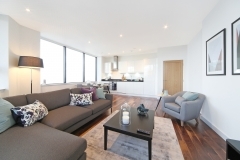 This new high-spec apartment building in the centre of Harrow is just a 30 second walk from Harrow on-the-Hill station, and 12 minutes from Marylebone. 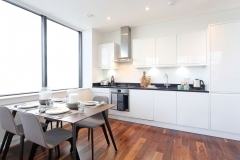 Located opposite St Anns shopping centre, these 4-8th floor serviced apartments offer great views across London and feature under-floor heating. 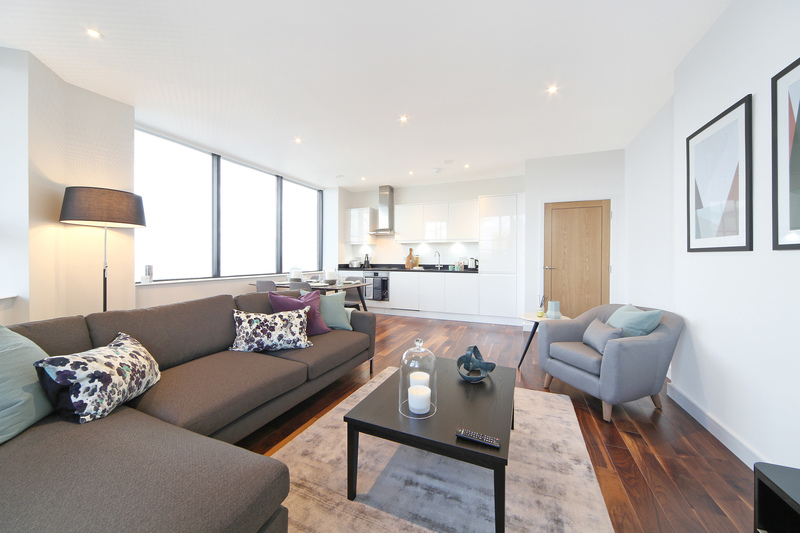 There’s Wifi, Smart TV, parking, a washer/dryer, step-free lift access and zip and link beds. Harrow’s a lovely town centre with a plethora of popular shops, cafes, bars, restaurants and entertainment and is extraordinarily well connected. 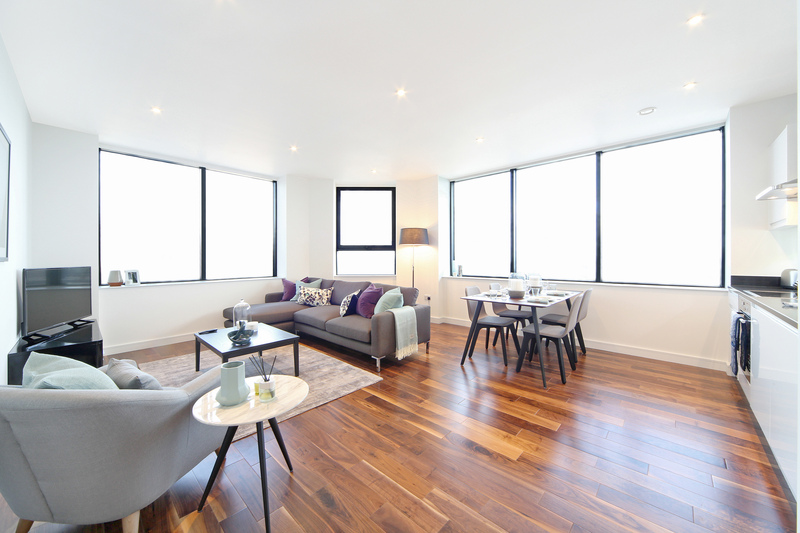 The building provides a spacious, modern and safe living environment with an on-site gym and secure underground parking. 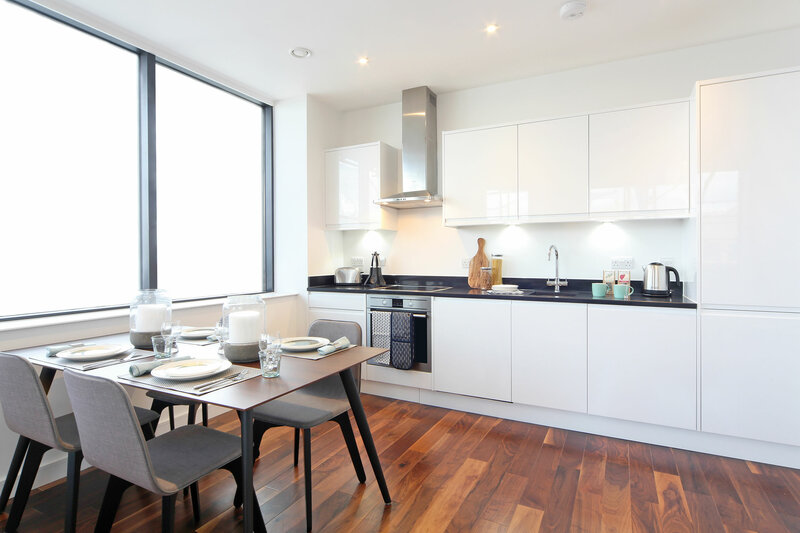 All apartments feature an open-plan kitchen/living area, a fully fitted kitchen, 17 mpbs Wifi, a Smart TV with integrated DVD player and a washer/dryer. The kitchens have a separate fridge and freezer and a dishwasher. The living areas have a dining table with four chairs, an armchair, a sofa and coffee table. The main bathrooms are spacious and feature a shower over bath, radiators, and large mirrors. The floors are mostly engineered wood, the bathrooms are tiled and the bedrooms have carpet. 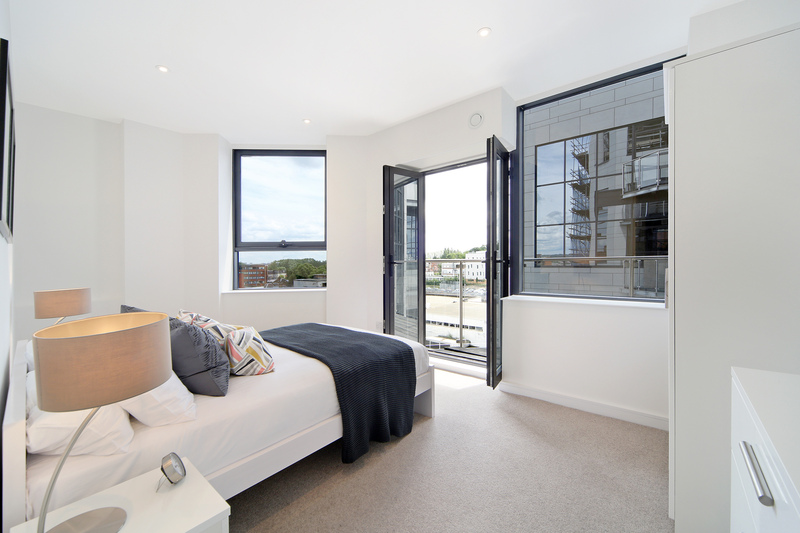 The main bedrooms have a double bed with a bedside table, wardrobe, reading lamp and blackout blinds. The beds in the master bedrooms are standard doubles, so 4 feet 6 inches wide, 6 feet 3 inches long, or 137 cm width 190 cm length. 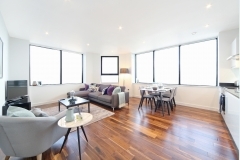 -The 1 bedroom apartments are 50 square metres (538 sq ft). -The 2 bedroom 2 bathroom apartments are 65-73 square metres (700-786 sq ft). The second bedrooms have zip and link beds so you can choose between a king double (5 feet wide 6 feet 6 inches long, or 152 width 198 length) or two singles. The en-suite bathrooms have a shower in a cubicle. Harrow is a suburban town in the London borough of Harrow and is 10.5 miles northwest of central London. The apartment building is right in the middle of College Road in the centre of Harrow, opposite St Anns Shopping Centre and next door to Harrow-on-the-Hill tube and train station. It’s a 10-15 minute drive from the A40, the M1 and the M25. Harrow is north of Greenford and Perivale, east of Ruislip, south of Stanmore and south-east of Wembley. Also nearby are Pinner, Eastcote, Ickenham, Wealdstone and Northwood. The famous Harrow School and the University of Westminster (Harrow Campus) are in the neighbourhood, as well as three hospitals, namely Northwick Park Hospital, St Mark’s Hospital and BMI The Clementine Churchill Hospital. The 8 storey building opened in 2016 and features a gym with a good range of cardio equipment, weights, and machines. There’s secure underground parking (chargable) which can only be accessed with a fob. The maximum vehicle height is 1.9 metres. A reception area provides seating, free Wifi and a large meeting space, and there’s also a garden deck. The property manager is present in and around reception from 9am until 6pm Monday to Friday. There’s also a security person present from 6pm until 9am.